Please note that you can now login with your date of birth. To make a payment, please enter your date of birth as MMDDYYYY or your account number; and the last 4 digits of your social security number. If you choose to login with your account number, please enter your account number without any letters, and without the dash and the digit following the dash.Your account number can be found on any payment receipt. 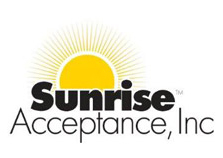 If you are having trouble logging in, please contact a representative during normal business hours at (423) 244-2604 or email us at customerservice@sunriseacceptance.com.